Staff is a Responsive Joomla (Desktop, tablet, mobile phoneâ€¦) simple, clean and Professional template. It comes with 10+ homepages, Many more inner Pages, Awesome Slideshows and Color Variations. Easy-to-customize and fully featured design. 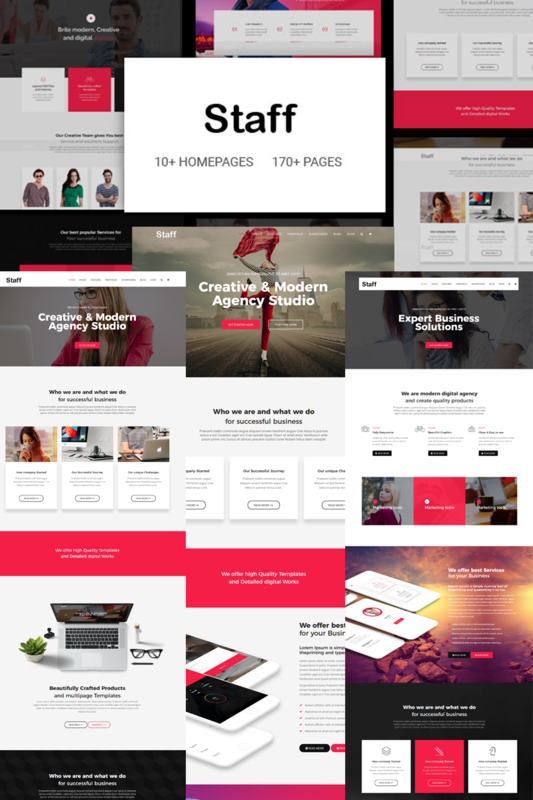 This template Created for all business such as Corporate, Business, Portfolio, Hosting, Creative, Blog, Construction, etc.. This theme comes with necessary features for your online presence and has 10+ home page demos available, blog pages, shop pages and many more. Staff can be a great choice for your online presence. Build your company website easily with the Drag and Drop Sp Page Builder Pro. MySQL database server Capability of uploading files over 1Mb size to the server Capability of uploading files with the following extensions: '.php', '.inc', '.zip', '.css', '.js' as well as the graphic image files.